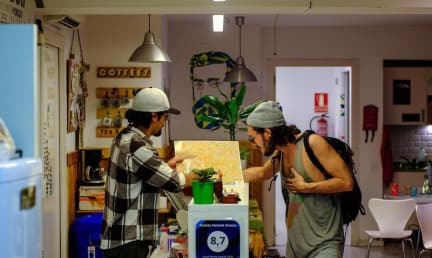 Rocket hostel Gràcia was perfect place for me to stay in Barcelone, close to the metro station, common area is bigg enough ... Diego and all the other staff were too warm and friendly, everyday there was different activities planned by the staff... I highly recommend it !! Great hostel. Super cozy. Close to the metro and a few shops. It is up a steep hill but not to worry as there is an escalator to the street. Very welcoming place. I'd never been abroad or stayed in a hostel before, hopefully they're all like this! This Hostel is a hidden gem in Gracia. Next to all public transport options. Next to a big park for a walk. Quiet neighbouring, and quiet nights. Diego and Team Members, always offered their best, really dedicated Team. You feel like home, and every good action you make for the others, come back to you, all the time. Good and friendly travellers. Good beds and secure storage (you need a lock) Clean Hostel! Best value for money in long time! Recommended for experienced Hostelworld travellers. Rocket Hostels is just fantastic! You really feel at home from the first second. Its soooo cosy and the staff is so friendly, nice and helpful. Its the perfect place to get to know other travellers. They even organize activities every day and the even though you might be sleeping with other 15 people in the same room, the little curtain you have in your bed allows you to have a little bit of privacy! Completely recommendable! Really friendly staff and great social area. Garcia district is a great area to stay (I preferred it to the centre of Barcelona). Would stay again! Clean hostel! Shout out to Marco and Diego and everyone for being so helpful. Beds has curtains for privacy. Thank you ! This hostel is in a real neighborhood of Barcelona which I enjoyed and thought was fun. Right by Guel Park it was in a very cool location. The sleeping pods gave me some of the best sleep that I got my entire time of traveling from hostel to hostel and I felt very refreshed by not getting woken up by the earliest person in the room every morning. I was there for a weekend and the hostel had free dinner which was a nice way to meet the people. They organize fun events every night. I have a very mixed review as I booked for three nights and had to leave after two due to an uncomfortable/unsafe feeling from a fellow hostel goer (a 76y.o. man), however, he was eventually encouraged to leave due to many circumstances. Anyways, the check-in was friendly, and I got a free towel, the room was long and slim and was quite warm, it was quiet. 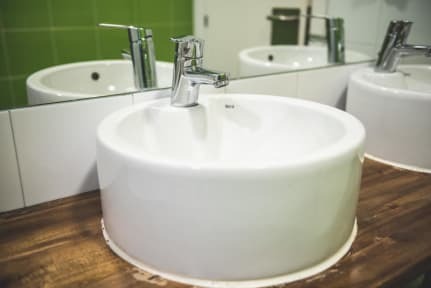 However, it was not a socially encouraging Env't, location far out of the centre, and dirty bathrooms - closed for cleaning at 10:30 am when needed.